In order to get a final list of team members, each team must finalize their team roster by September 2nd. For your roster to be finalized, each team member must have a user account and be listed on the Team Information page. Note that all members must be confirmed and NOT listed as "pending" (i.e. they should be in the Team Roster section of the Team Information page. See [http://2009.igem.org/wiki/images/a/a5/Team_roster.png this example]. Be sure to include all members who participated over the summer, not only those who will be attending the Jamboree(s), as this list will be used to create participation certificates (so check for spelling mistakes too!). Please see the [[Requirements | Requirements page]] for new information on team composition. Please see the [[Requirements | Requirements page]] for information on team composition. 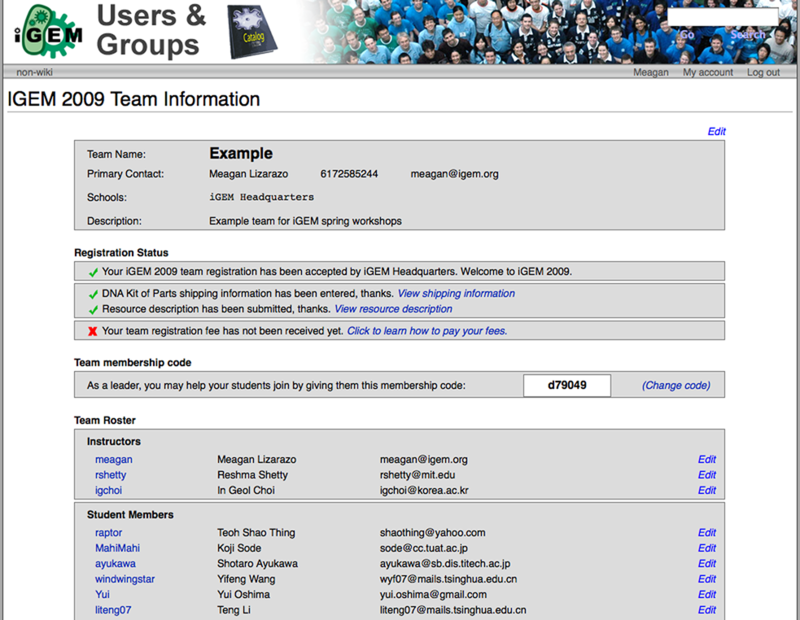 For more information on how to add members/edit your Team Information page see the [[Registration_Handbook | iGEM team Registration Handbook]]. In order to get a final list of team members, each team must finalize their team roster by September 2nd. For your roster to be finalized, each team member must have a user account and be listed on the Team Information page. Note that all members must be confirmed and NOT listed as "pending" (i.e. they should be in the Team Roster section of the Team Information page. See this example. Be sure to include all members who participated over the summer, not only those who will be attending the Jamboree(s), as this list will be used to create participation certificates (so check for spelling mistakes too!). Please see the Requirements page for information on team composition.